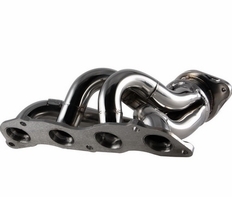 About DC Sports Polished Stainless Steel Headers DC Sports headers are made of 100% T-304-stainless steel, including the flanges, eliminating any chance of rust. Our DC Sports polished stainless-steel headers feature hand TIG welds at the flanges, and our brushed stainless-steel headers feature machine MIG welds at the flanges that foster a tooled, custom-fabricated look. * 100% 304 Stainless steel construction including the flanges.